Americans are in an unfortunate position when it comes to the Holy City. It's ridiculously far away, yes, but its distance is almost exactly proportionate to how ridiculously great it is to be there. The only way to reconcile that normally is to drop a whole bunch of money on a flight. But right now, consider yourself blessed: Tickets to Rome can be got for miraculously cheap. 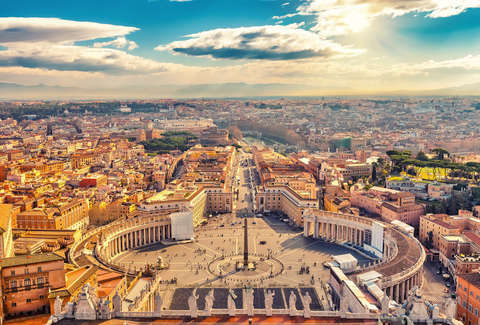 American Airlines, United Airlines, and Air Italy are all deeply discounting round-trip flights to Rome, Scott's Cheap Flights reports, which means that tickets that are normally around $850 are going for between $300 and $400. Taking a few examples, per Condé Nast Traveler, New York to Rome is down to $377 on Air Italy and San Francisco to Milan is just $438 on United (it'll mean a layover overnight in Newark). It looks like these are available from October 2018 to May 2019, but note that these fares won't last, so you should book as soon as possible. Round-trips can be had from cities including San Francisco, San Jose, New York, Newark, Miami, and Boston. But if you head over to Google Flights you might be able to find something for your location. Also, depending on your schedule, these prices will vary a bit and may not be as low as the ones listed. But they'll be way cheaper than what you'd normally pay. So, go live your The Lizzie McGuire Movie and/or La Dolce Vita fantasies IRL.